Welcome to my Essante Organics Review! So, here’s the situation. Essante Organics scam is a big question. A question that may affect your decision to join this lucrative network marketing business or decide to go search for something else. Before we dig into the company’s details, I’d like to welcome you for being here with me. To me, it sounds like you’re getting hooked with the idea of building your own business and get serious with it for future life savings. Whatever reasons you may have at this moment, I’d like you to fasten your seatbelts as we go through the brutal and comprehensive Essante Organics review and dissect the whole commotion of this MLM. From there, we’ll know if it’s a great business jumpstart or not. If you prefer something else, you go through our proven alternative business startup and earn a passive income while you’re being in control of the stakes (not by someone from the high authority). Are you ready? Let’s dive in. Shall we? Summary: Essante Organics is a network marketing company established in 2004 but rebranded in 2008 with another name. They offer non-GMO and organic products for the customers and distribute them across the United States through their Brand Partners. Is Essante Organics Recommended? No. I'll share the details with you in a bit. How To Make Money With Essante Organics? Essante Organics Review - What Other People Say About The Company? Essante Organics is an Arizona-based Multi-Level Marketing company offering non-GMO products sold in wholesale or retail. Be it Body & Spa (Oral, Skin, or Hair) or Baby Care. The company is similar to other network marketing companies like Amway, Avon, Herbalife, and Melaleuca. According to their Better Business Bureau profile, they opened on December 31, 2008, but their business is already recorded 4 years back. A year after they got the BBB records, they had their business incorporated in the same state and established as a Limited Liability Company (LLC). Technically, they have been operating for almost 11 years now, however, what I don't get or probably missed is the 4-year streak from their BBB registration and their actual opening date. In fact, they are not an accredited business albeit the A+ rating. What happened in mid-2004 to 2008? That's a good question we have to find that out. As I dug into the itty-bitty details about Essante Organics, I found out that Michael Wenniger, the founder, built an MLM business under the name "Essante Worldwide." But for some reasons (which I don't know), he rebranded the company to "Essante Organics." One of the reviews wrote that Wenniger might have realized he needed to emphasize his company's mission to provide the goods or products that help people to live a healthier lifestyle. That's through removing toxins by using their products. That said, as an MLM, he sought the need to aid business folks to become debt-free as well. Among the other top competitors, 100 Percent Pure, Pure Haven, and Truegoods are the top 3 biggest rivals. According to a review site, they mentioned the competitive analysis between these big companies and revealed that Michael Wenniger earned 88 out of 100 CEO score with $10M in revenue. Given their 10-year streak in the MLM industry, it's expected for Essante Organics to have produced a wide range of products to sell for their potential customers and distribute through their hard-working members. Currently, many of their products are on 20 to 50% off from their original price. So, it'd be best to get these while they are cheaper from their regular price rate. But the majority of the items offered in discounts consist of Vital Oils, protein shakes, catalogs, and liquid luffa. Other than these, they set the price at their regular markup. 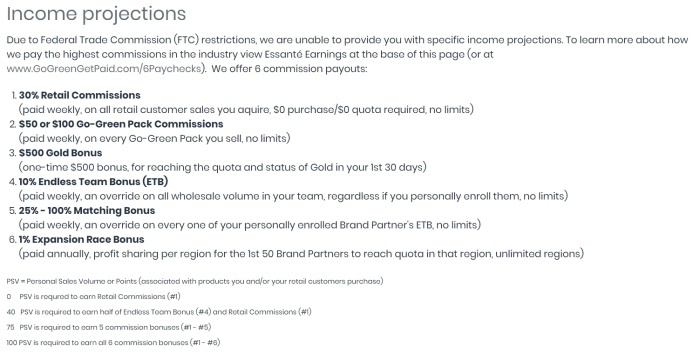 When you become one of their Brand Partners, you're likely to enjoy the following compensation Essante Organics pay you. You see in the 6 commission payouts below, you receive weekly payments from your retail commissions without required PV or SV per month versus the other typical compensation system of a network marketing companies out there. That alone is enticing. In addition to that, you don't stress yourself to the point of exhaustion with only 7 to 10 working hours per week to maintain the business without compromising the recurring income from your sales. However, once you get ambitious and try to get all the 6 compensation rates at once, you have to strive harder by achieving as much as 100 Personal Sales Volume (PSV) per month. No required PSV for Retain Commissions. 40 PSV is required for Half of Endless Team Bonus & Retail Commissions. 75 PSV is required for 5 commission bonuses. Lastly, 100 PSV for all the commission bonuses. Though you earn loads of bonuses from Essante Organics, you have to keep in mind the occurring tax deductions. That said, the company even asks you to have a CPA to keep these notes in your reach, especially when it comes to the monthly expenses you need to maintain the business. They wrote, "We are not CPAs, yet we highly encourage you to contact your [CPA]." This is in regard to your related home-based business that might likely reach in significant rate depending on how much you are earning per month in this "lucrative business" they're offering you. This is what their site tells you. To have an objective point of view, we’ll see how others outside from Essante Organics describe the overall company based on experiences as a Brand Partner or a mere member. If you want to leverage your business by learning the 4-step proven and legit method to earn money online, even if you invest in an MLM, get your FREE copy of our Ultimate Make Money Guide. What surprised me is the fact Essante Organics satisfied more people in contrast to other reviews I've come across on the web. Out of 302 people who reviewed the products, they almost have a perfect score when it comes to customer ratings. If you ask me whether these are written by bots or not, that I don't know. What I only see on their official Facebook page are the satisfactory remarks from different citizens sharing their wonderful experience with Essante Organics products. While I scroll down the tons of reviews on their Facebook page, I've seen a few people who revealed the real scenario underneath that could affect the integrity of the company. One of these reviewers I believed former Brand Partners wrote that recently Essante Organics changed their product formulation affecting their trust with its effectiveness. Since the change, she tried to approach any of the company's staff to answer their inquiries. Instead of handling these concerns as professionally as possible, Essante Organics shut them off by blocking them from the company's community page. More so, another woman came up and revealed that Essante Organics aren't honest with their certifications. She wrote they apparently not certified with USDA. So, I went through the USDA Database and see if I can find Essante Organics as one of their certified products. However, I couldn't find any records of the company or whatsoever. That confirmed the rumors about their claims of being USDA-certified. 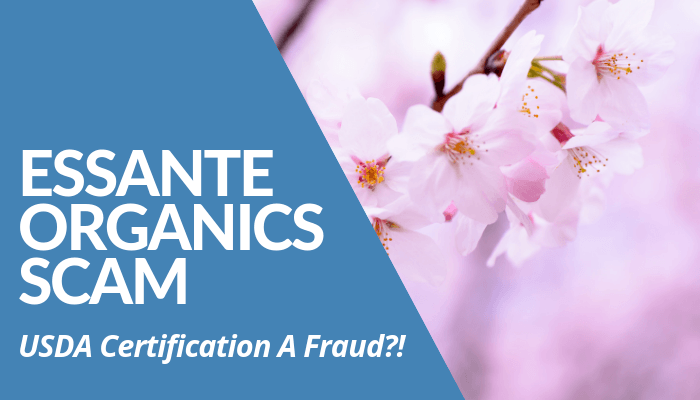 To sum up, Essante Organics isn’t a scam but the company does seem a bit sketchy when it comes to the truth of their product certification. They provide legitimate and effective products as well as clear compensation payouts. If they could explain their side regarding this, it’d be better. However, as far as my research goes, this network marketing fails to meet expectations. Additionally, the manner they handle their Brand Partners unprofessionally is a red flag. As a Brand Partner, they have the prerogative to ask because they want to protect their customers from possible harm because of the formulation change. And by doing that, asking questions affecting their integrity, isn’t the right way to handle the case. Learn How To Build Your Own Lucrative Business Here! Building your own business relying solely on MLM makes it tricky since you have to make sure your money and effort won’t go to waste. The thing is most of the factors affecting your business aren’t controllable. Most of the time, it’s affected by the company and their high ranking officials doing the work, leaving you as a Brand Partner helpless. 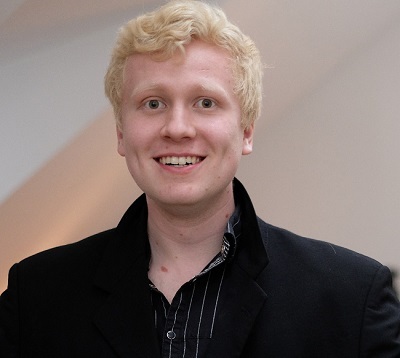 In contrary, Roope “Robert” Kiuttu’s suggestion of building an online business is legitimate and proven. He’s been an affiliate marketer for 4 years now. Since he established Your Online Revenue in 2015, he’s able to leverage himself as a mentor and as an online entrepreneur. He’s able to help more than 3,000 individuals under his belt through teaching them the 4-step technique he’s done for his own business to where it is now. Do you want to build your own lucrative business this 2019? If your answer is, "Yes!" follow Roope's Ultimate Make Money Online Guide to get started for free. 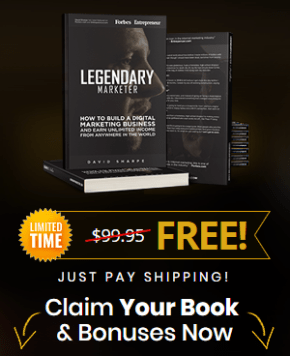 If you want to replicate the success as well as other 13 successful entrepreneurs, grab his Ultimate Make Money Online Guide for free with 9,000+ words he wrote for you for days. Once you get into the same boat as he, you could take advantage with the simple steps he’s going to teach you to build yourself up as a rookie businessman to earning your first dollar without guesses. 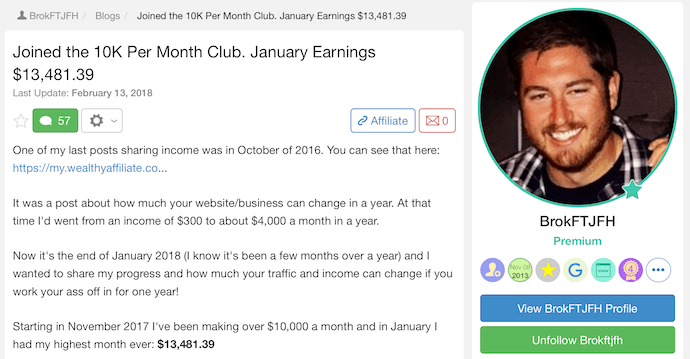 If you’re interested, you can join him and take a step closer to our step-by-step training for free and learn how affiliate marketing changed his life. I prefer Wealthy Affiliate than any other income-earning opportunities out there. Once you get in, you can enjoy 20 interactive videos teaching you the process of becoming an affiliate marketer and earn as much as $10,000 without doubting the products you sell upfront. They also provide premium training if you want to scale your business up. He’s enjoyed these services, thus, he knows what he’s recommending and why. Just so you know, he’s a Christian and he doesn’t want to put anyone into an endeavor that put you into harm. Wealthy Affiliate paves the way to quitting the dreading 9- to 5-day job and to enjoy the laptop lifestyle successfully you deserve unlike in MLM promises you to achieve. Now that I have shared my thoughts in my Essante Organics Scam post, I turn the tables and ask your opinions this time. I want to hear them. Do you have any Essante Organics-related experiences or any MLM you can share? Do you prefer network marketing or affiliate marketing as a source of income? If you have further questions that I haven't discussed in the post, feel free to leave them in the comments. On the other hand, if you feel like you want to learn more about Roope’s step-by-step formula and his top recommendation to making money online, leave a comment as well and he'll be happy to be of help.